When President Charles Blanchard died from a heart attack at age 77 in 1925, Dr. John Wallace Welsh, pastor of College Church, college trustee and occasional instructor, was called to serve as acting president ad interim. Blanchard’s successor was originally intended to be W.H. Griffith-Thomas, the Reformed Episcopal author, Keswick Conference preacher and co-founder (with Lewis Sperry Chafer) of Dallas Theological Seminary. The plan was that Griffith-Thomas, when asked to join the teaching staff in 1923, would eventually assume the presidency; but the eminent theologian declined the offer. Before coming to Wheaton, Welsh, a native of Elmira, N.Y., pastored in Princeton, IL, at the church once led by abolitionist Owen Lovejoy, an original trustee of Wheaton College. During his Princeton years, Welsh enjoyed close association with evangelist Billy Sunday, who preached a sweeping revival from Welsh’s church. The 1927 Tower describes Welsh as “…resourceful, self-reliant, aggressive, unceasing…” He had two sons: John, Jr, who became the college’s first physician, and Evan, who also served as pastor of College Church (1933-46), and later as chaplain for Wheaton College Alumni Relations. 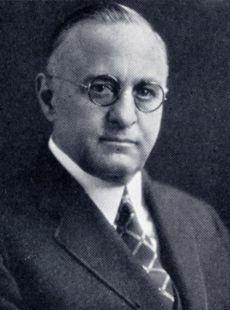 John W. Welsh served faithfully during uncertain days until a young evangelist named J. Oliver Buswell was unanimously elected as Wheaton’s third president in 1926. Shortly thereafter Welsh retired from College Church and moved west to do field work for the Los Angeles Bible School. He received an honorary degree in 1925 from Wheaton College. Welsh died in 1947 at age 73 in Newton, Kansas, following a stroke. In addition to his sons, Welsh was survived by his wife, Mary.